Shalu Garment District is well renowned in Taiwan for its wholesale markets of Luliao and Lufeng town. 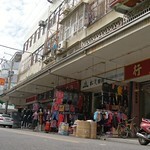 The merchants often come from all around Taiwan to buy wholesale clothes. The history of garment wholesale is traced back to the 1960s and 1970s. Vendors selling garment in the rows of streets during that period developed a great amount of garment stores on both sides of Zhongshan Rd today. The region of garment wholesales supply clothes to retailers is in south of Miaoli and north of Xinying. The price of Garment wholesales is much cheaper than retailers or department stores, and it has become the distinguished feature in Shalu Township.